Wait, You Didn’t Spend President’s Day Looking for a Mystery Stench? I love all the lesser federal holidays. You know, like Columbus Day and Veteran’s Day and MLK Day and President’s Day and Flag Day. Ok, that last one is not a federal holiday, but it should be. Since I live in DC, my company follows the federal holiday schedule and that means random Mondays off about once a month. It’s awesome. You get to sleep in, maybe go shopping, have a nice lunch, maybe have a little daytime wine at lunch. 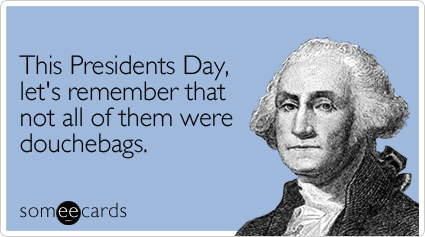 But since I’m an idiot, I scheduled work on President’s Day. So, I dragged myself to my deserted office for the scheduled 10 am phone interview I had set up with the hard-working owners of a company that was not off for President’s Day, apparently. I worked for a couple of hours and then rode the lonely metro back home. I stopped by a wine bar on the way home so I could at the very least get my daytime wine on. I had big plans to go to the gym, but when I got home, there was an entirely different workout awaiting me. Our kitchen stinks. It stinks in a way that is, quite frankly, impossible to ignore and definitely embarrassing. Even more embarrassing is that we noticed it a day or two ago, right before a not-so-surprise birthday party XFE threw for me on Saturday. 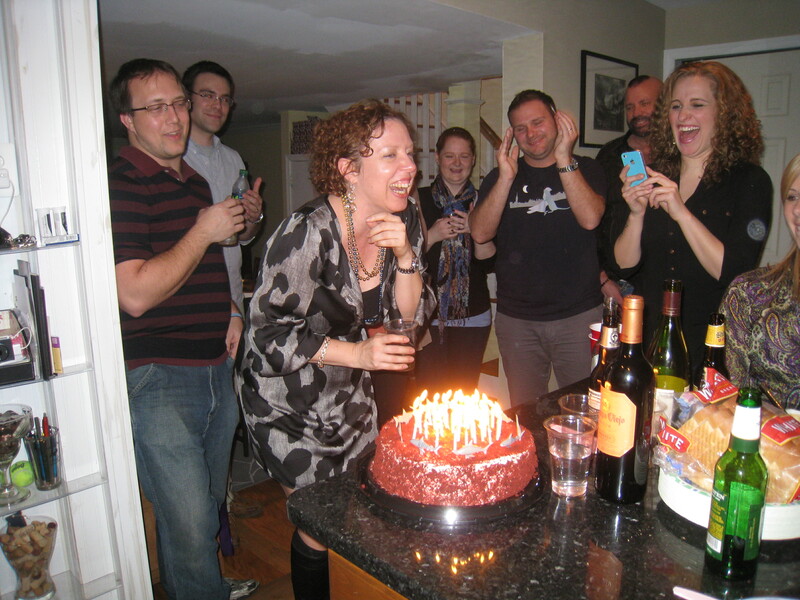 Sidenote about the birthday party: It. Was. Awesome. There were two briskets cooked on the Big Green Egg, shark tattoos, a plastic tiara, TWO types of birthday cake (chocolate and red velvet – decorated with plastic sharks, of course), and some sort of alcohol called “Or-G.” I dunno what it is or what it does but it came in a very pretty bottle. 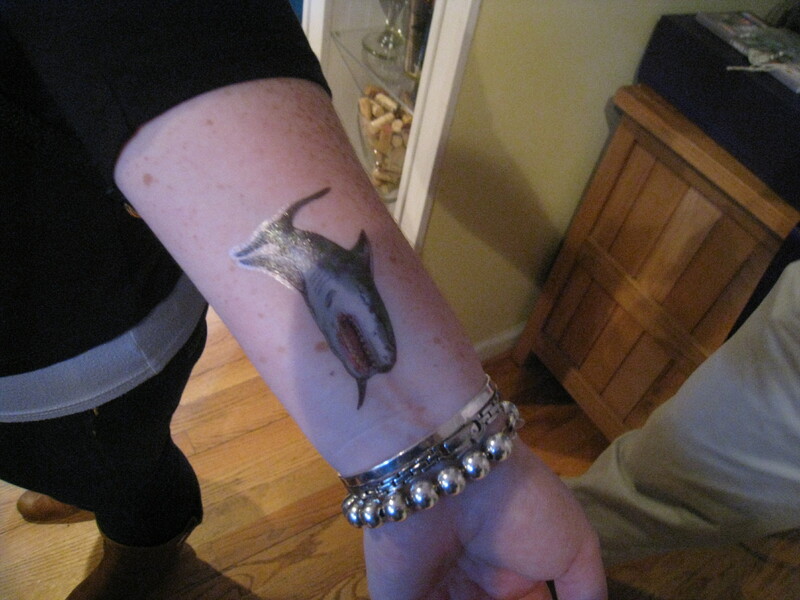 Did I mention that there were shark tattoos? This one is eating my earring! That would be a cake. Decorated with sharks. A shark about to eat Suzanne's bracelet. Man, these sharks really like jewelry. 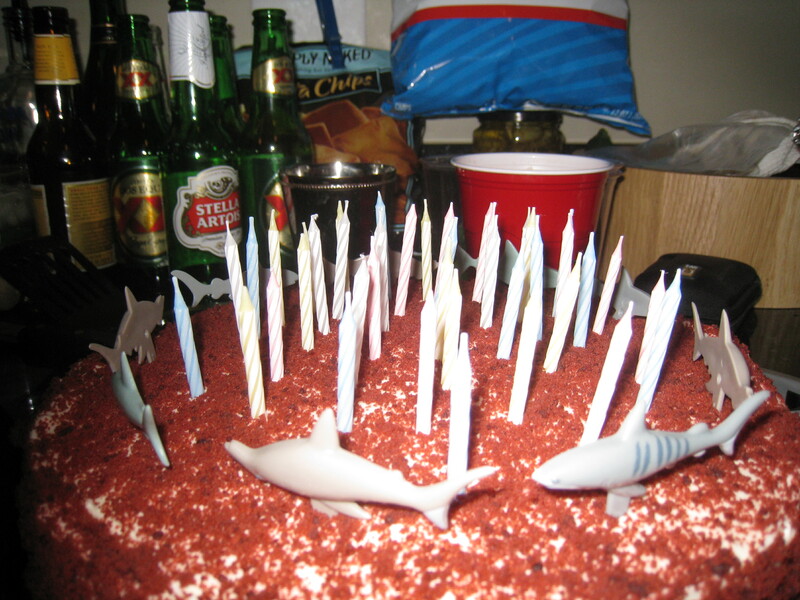 That would be me, about to dominate that shark cake. And it's 40 stupid candles. Don't worry. I got them all. It was a lot of fun and I did not lift one single finger. XFE did everything from cooking to lighting candles once it got dark to cleaning up before we went to bed. It was the best kind of party. He even mopped the kitchen the next day while I went shopping with my special surprise out-of-town guest Emilia (seen above with the blue iphone). If I could clone him, I’d make a fortune. Anyway, back to the smell. Ladies and gentlemen of the Internet, I do not know how to describe this smell. It is nothing short of rancid. It smells like something that might have once been alive but clearly is no longer. It smells like incredibly expensive cheese. And we cannot figure out from where it’s originating. 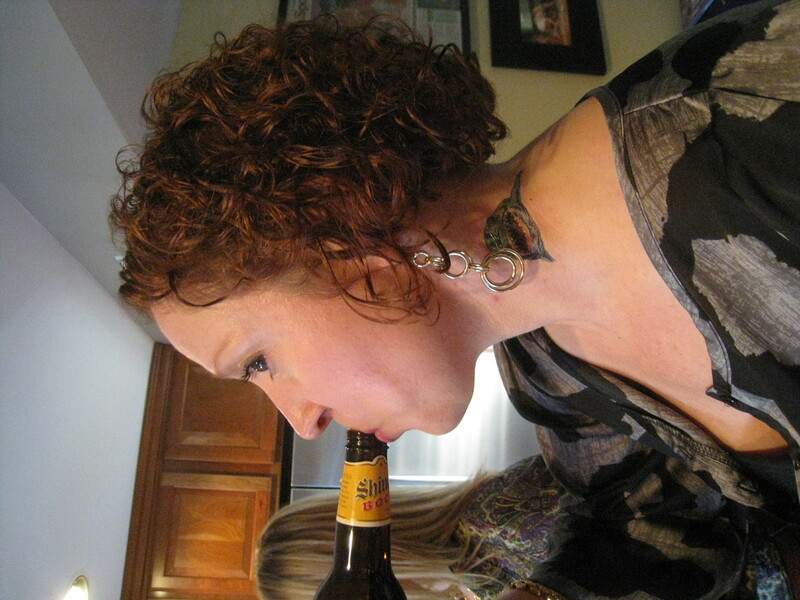 We were fairly certain it was from the fridge, but we went through the day of the party, and there was almost nothing in there that would have caused any stench because everything is either in a closed container or processed within an inch of its life. So we thought it must be something festering under the shelves or under the containers just out of eye (but not nose) sight. We shrugged and considered it our personal protection device for our prized Shiner Bock collection in the bottom drawer of the fridge. Today when I got home I couldn’t stand it anymore. I dismantled the entire refrigerator, all the shelves, all the sliding drawers, all the hanging drawers on the door. I inspected suspiciously old condiments (including an impressive collection of Asian marinades and a 34 ounce bottle of ginger dressing from Costco that says it doesn’t expire until July, but honestly, who knows). I sniffed containers of individually wrapped wedges of Laughing Cow cheese. I peered into jars of banana peppers and pickles. Nothing. Nothing was leaking. 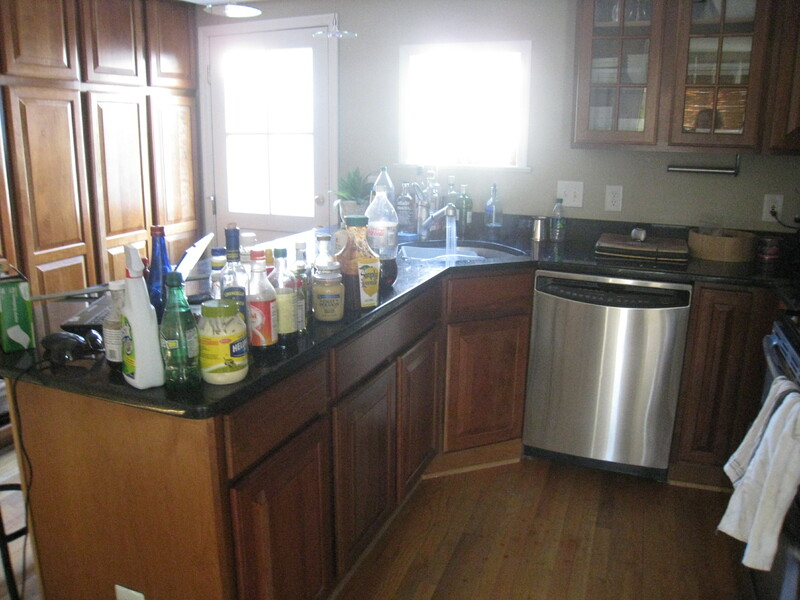 There were no suspicious puddles of brown liquid to be found pooling under the crisper drawers. I have no idea where the smell is coming from. I guess since I got them all out, I might as well clean them. When XFE got home, I even had him pull out the fridge to see if something had rolled underneath. Then I had him pull out the trash compactor to see if something had gotten trapped under there. Nothing. This is going to make me crazy, guaranteed. On a positive note, in the haze of spraying Fantastic all over the fridge and thinking I needed to try to use the Swiffer under the fridge as well, I ended up Swiffering under our bed upstairs and amidst an alarming pile of cat hair and dander (I’m surprised we’re not coughing up furballs), I found a crisp $1 bill. Our maid really should take some heed and start Swiffering under that, not just because, oh, I don’t know, we pay her to clean our house, but because, apparently, we also stash money under the bed. Oh, look who else came to the birthday party. 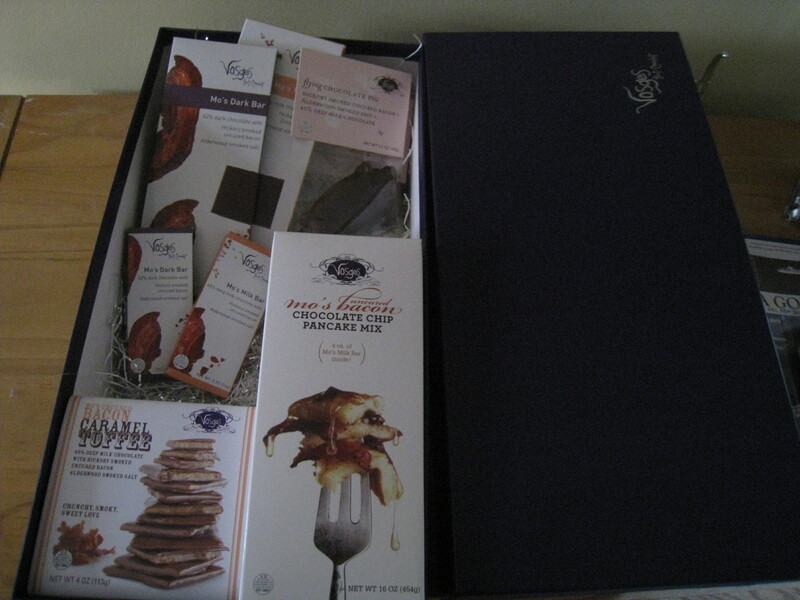 A Vosges Mo's sample pack. Welcome. Now get in my belly. As for the smell, do you keep potatoes out of the fridge. Usually when I have a Smell problem it ends up being a rotten potato. Just a thought. No, no potatoes. 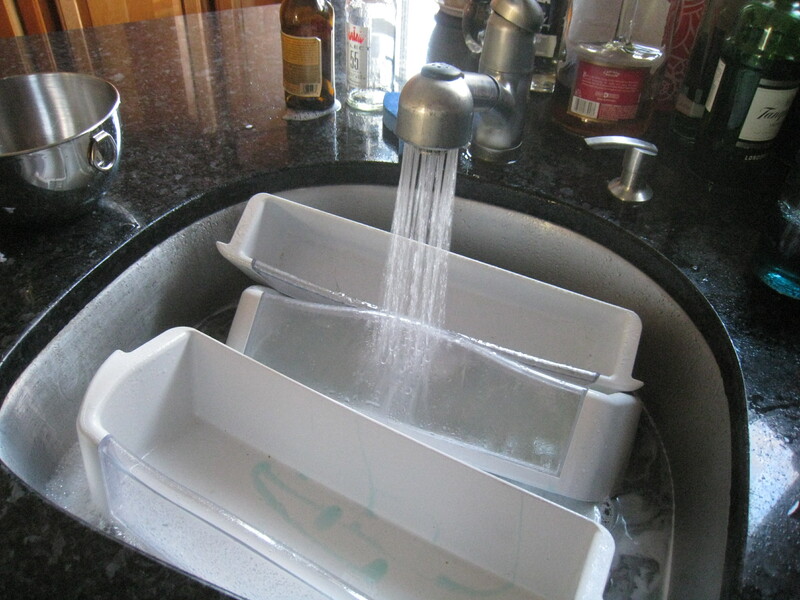 We think the fridge just needed a good scrubbing and a new box of deodorizer. The smell seems to have gone away.